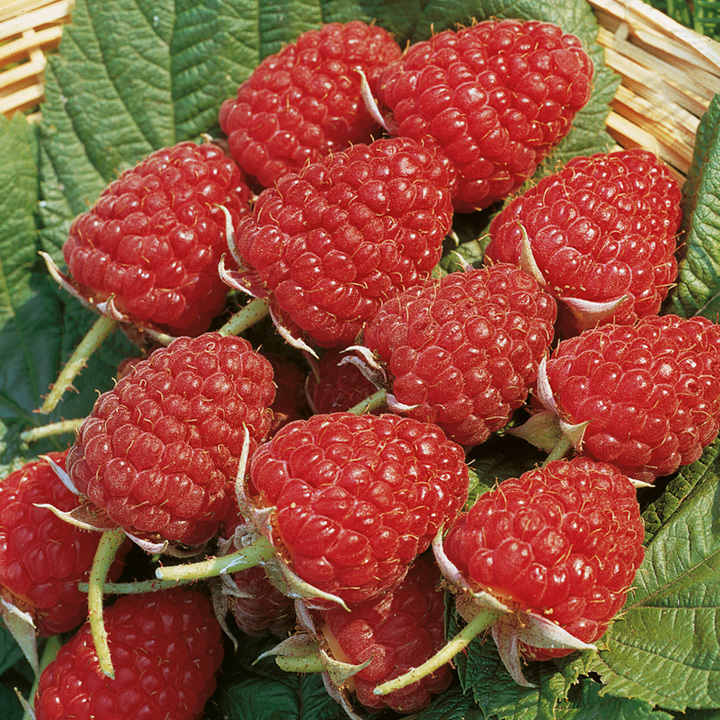 Our long cane raspberry plants are supplied with approximately 1.2m (4') of year old fruiting wood still attached, so you can plant them and be cropping from mid July in the same season! The first delicious berries will be ready to pick from mid July. Why not try five long canes in a wigwam in a large pot and enjoy fresh raspberries on your patio next summer. Plant and crop same season! The long stems (known as canes) that are produced can be tied to wires (12-14 gauge) against a wall, fence or garden shed. It is better to plant Raspberries in the open garden and to tie the canes to wires strained on stout posts. This way, good light and air circulation are achieved. When raspberry growing if possible, run the rows north to south as this will permit maximum light penetration into the crop. Should there be more then one row, leave 1.8 metres (6′) between them. Bear in mind, when siting the plants that birds are attracted to the ripening fruits and protection is advisable. If a fruit cage is available, plant the Raspberries in this or position them so that a cage or netting can be easily erected over the plants if required. To support the plants, erect stout posts, 2.4 metres (8′) long with about 60cm (2′) buried below soil level. Stretch wire, horizontally, between the posts with the strands at 60cm (2′), 1.2 metres (4′) and 1.65 metres (5½’) above ground level. The end posts should be supported with struts at 45° so that they can better withstand the wire tension. Plant 60cm (2′) apart in the rows with 2.2 metres (7′) between rows. These distances are greater than for summer fruiting varieties to allow room for the development of more canes per plant. 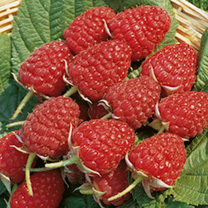 Each raspberry cane will bear less fruit than will summer cropping varieties so it is good policy to leave more of them and, thus, increase the yield per plant. Fruits will ripen from late summer through to the first frosts and will appear little and often. 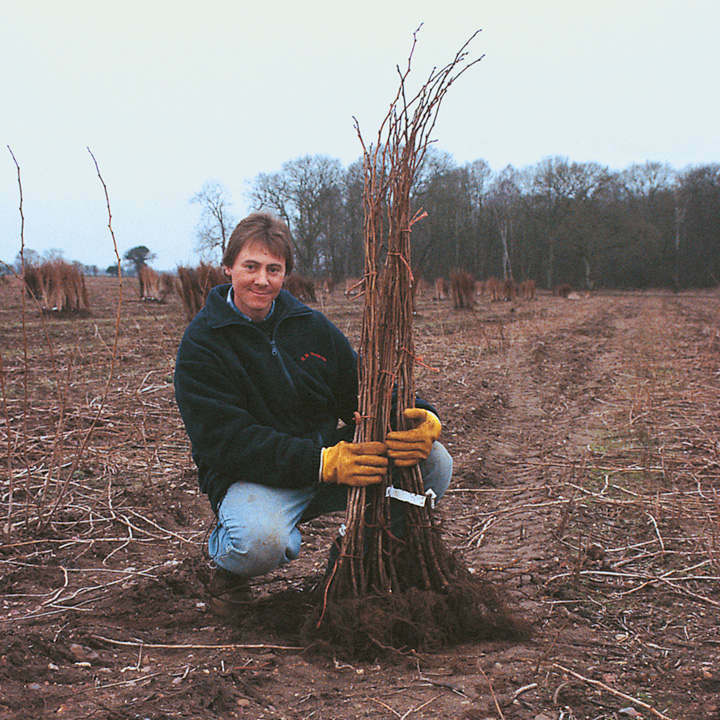 Immediately after planting, cut the canes down to 22cm (9″). When new shoots have developed from the base of the plants, cut the old canes away at ground level. In subsequent years, cut out all canes to ground level during the winter – not later than February**. With established plants, many new shoots will grow in the spring. Leave them to develop over a strip of ground so that each row bed is 75-90cm (2½-3′) wide. Hoe out those appearing outside the strip. If necessary thin out the shoots to leave them 8-10cm (3-4″) apart. **Recent research has shown that if a few canes are left on autumn fruiting raspberries a small extra early crop of summer fruit will be borne. This does not appear to significantly reduce the capacity of the canes to fruit again in the autumn. To take advantage of this leave some autumn canes uncut and wait for fruit in June then remove immediately leaving new canes to mature as above.